Ja-Co Welding contributes a substantial amount of work into the Oilfield Industry. With our two API 4F (PLS1 and PSL2) certified facilities we manufacture Substructures, Masts, Crown Block Assemblies and our top of the line Catwalks. 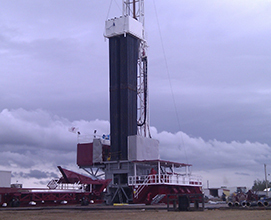 We provide our customers with numerous rig up pads all with multiple features. 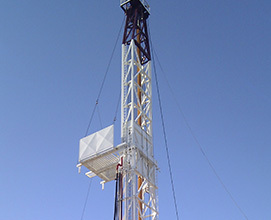 Along with our Oilfield products, we also inventory a wide range of oilfield components for Mud tanks, Catwalks, etc. Ja‐Co Welding is an API 4F certified facility, which allows us to manufacture substructures, masts and crown block assemblies to the highest standards. 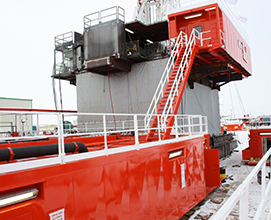 Working in partnership with engineers and our customers, we are able to design and fabricate custom rig solutions to meet any needs. The facilities at Ja‐Co Welding can accommodate the manufacturing of up to three complete drilling rigs at a time. Ja‐Co Welding manufactures a wide variety of oilfield products. Some of these products include: Mud Tank systems, Water tank/Doghouses systems, Combination Buildings and Pipe Transport Tubs. We can manufacture buildings of all sizes to accommodate any type of equipment and application. Ja‐Co Welding has become an industry leader in the fabrication of Hydraulic Catwalks. With our quality workmanship and outstanding design we have created a Catwalk with faster movement of pipe to the drill floor. Ja‐Co Welding is equipped with three large rig up pads, each with enough room to set up and operate a complete rig. Our first pad is a 90’ x 150’ level cement pad with a rig up shack. The yard around the pad is gravel and can be used for additional length and width if required. It is sourced with 280, 460 and 600 volt power. Our second pad is a 250’ x 150’ level gravel pad, also sourced with 280, 460 and 600 volt power and a rig up shack. This pad has a 9 5/8” cased test hole to a depth of 103m. Our third pad is the largest of the three. It is a level gravel pad which can be as large as required. This pad is not equipped with a rig up shack or power. Its primary use is for rigs with very large footprints, or when the other pads are in use. Ja-Co Welding manufactures and stocks a full line of oilfield components. These components include, but are not limited to: Pump stands, Mud gates, Bridge valves, Mud troughs, Pivot Cups, Support Rods, Sheaves, Transition Rollers and Skate Assemblies, etc. With our processing and machining departments we are able to manufacture multiple components at a time to ensure the product is always on hand. 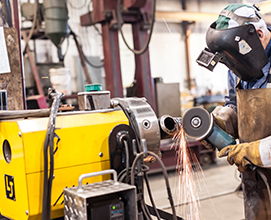 Ja‐Co Welding employs B‐Pressure welders with the ability to conform to a variety of ASME approved procedures for all types of pressure welding ranging from 5,000psi to 10,000psi systems. 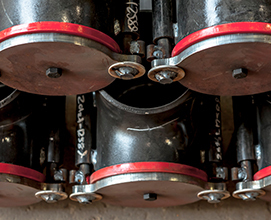 As well as steam, air and hydraulic piping, both threaded and welded connections. Ja‐Co Welding also houses a state of the art hydro‐test bench capable of documenting and reporting all test results.